J&K Bank Recruitment 2018 - Apply Online for 1200 Banking Associates Posts in J&K Bank, Across India. 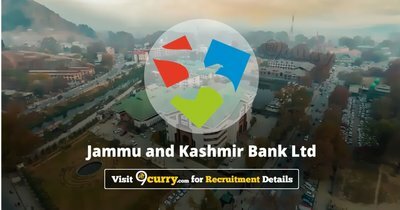 Online Applications are invited by Jammu and Kashmir Bank Ltd from 24 Oct 2018 to 30 Nov 2018 for 1200 vacancies. J&K Bank Banking Associates Admit Card 2019: Jammu and Kashmir Bank Ltd has issued the Admit Card on 14 Apr 2019 for J&K Bank Banking Associates Exam 2019 which is scheduled to be held on 26 Apr 2019. J&K Bank Banking Associates Admit Card 2019: Jammu and Kashmir Bank Ltd has issued the Admit Card on 11 Feb 2019 for Banking Associates Exam 2019. Eligible candidates may download their admit cards between 11 Feb 2019 to 24 Feb 2019. Pay the Examination Fee through Debit Cards (RuPay/Visa/MasterCard/Maestro), Credit Cards, Internet Banking, IMPS, Cash Cards/ Mobile Wallets. Presently, the starting basic pay is ₹13075 (With 2 Advance increments) in the scale of ₹11765 -655/3 -13730 -815/3 -16175 -980/4 -20095 -1145/7 - 28110 -2120/1 -30230 -1310/1 -31540 & other perks applicable to Banking Associates. Eligible candidates may apply online at J&K Bank's website (direct link is given below) from 24 Oct 2018 to 30 Nov 2018. Candidates log on to https://www.jkbank.com/. Go to "Jobs" & Select the desired post.